It is our pleasure to be in your service as we care for your vehicle. It is our commitment to consistently and quickly provide passionate service that makes your day great. Our hours of operation are listed on our literature and website but we reserve the right to change our hours of operation at any time for repairs and maintenance, holidays and or open late or close early due to inclement weather. Our advertised prices are developed with regularly maintained vehicles in mind. For example a regularly maintained vehicle takes 3 to 4 minutes to vacuum and our fee structure reflects this. Vehicle Size and or Condition, as evaluated by us, may increase your fee. Access to Unlimited Club Membership benefits requires a Membership Card that matches the vehicle. Or you may add your membership barcode to our Unlimited Auto Wash Club App by clicking “Club Card” and entering your name and bar code number then click Save. Special offers on our Unlimited Club Membership may be limited to first time customers and or for first month of a three month minimum term. Minimum 3 month commitment required when joining club and Non-transferable. Membership auto-billing, using credit card provided, occurs on the anniversary date you signed up each month. If you started on January 3rd your billing will occur that date each month. You may cancel after first 3 months. Billing managed through ABC Financial and requires at least 5 days notice prior to the anniversary date of your next billing cycle for cancelations to avoid billing to your credit card. Early cancelations do not yield a refund and will allow you to use program through anniversary date. Multi-car Discount available if additional vehicle on same account using same credit card. Oversized Vehicles such as; Excursions, F250/350, dually’s, raised trucks and commercial vehicles or vehicles that are not in factory original and regularly maintained condition may be excluded from these plans or incur a per visit upcharge which may vary at the sole discretion of the manager on duty or accepted at a different price point with similar or additional limitations. Commercial Vehicles are excluded in most cases from our Unlimited Club but other discount programs for Commercial, Limousine, and Municipalities may be available. We reserve the right to remove any vehicle and categorize the vehicle use as Commercial when it is believed to be used for transporting people for compensation, for example Uber Driver Use, or is used commercially leading to out of the ordinary obsessive program use. Contact us for more details. Seasonal customers and all vehicles accepted at the sole discretion of Unlimited Auto Wash Club management. Seasonal customers returning each year may suspend/cancel their membership after initial 3 month term and reactivate upon return to the area by calling 561-WASH-ME-2 (561-927-4632). Unlimited Auto Wash Club reserves the right to; temporarily close our locations due to inclement weather, circumstances beyond our control, holidays or equipment failure and to revoke membership for member violations of terms and conditions without refund. Vehicles may be driven thru wash tunnel by our staff only. You may remain in the passenger seat or rear of vehicle upon request if approved by management. Owners of ADA altered vehicles will be asked to drive thru with guidance from management. From time to time we have special offers and discounts. Some of our offers are for first time customers only and may not be available to repeat customers. All such offers may be rescinded or changed at any time and final price is subject to per visit management review based upon Size and Condition of vehicle. All services are provided on a best efforts basis. As such we are not responsible or liable in the event that we are unable to remove stains, clean, or fully restore any surface, fabric, or condition of your vehicle. All details of services listed on our website, signage or in our marketing materials are for reference only, and in some cases, some of the noted service details may or may not be performed depending upon the condition of your vehicle or upon our acknowledged expertise regarding determination of appropriate circumstance. While it is our policy to make a best effort to care for or organize any items left in vehicle, we do often use a pressurized air nozzle and a vacuum in the normal course of cleaning and in all cases we are not responsible for any valuables that may become damaged, lost, missing or otherwise disposed of in the course of cleaning your vehicle. We strongly recommend that you remove all valuables before leaving the vehicle for service. We are not responsible for; damage or injury due to faulty mechanical operation of vehicle, or vehicles that are not in factory original condition or any incidental damage that may occur while your vehicle is in our possession, including but not limited to any damage related to pre‐existing conditions (tears, scratches, dents, stains, odors, etc.) damage to automated windshield wiper systems, wiper blades, rear window wipers, loose interior trim or exterior moldings, exterior mirrors, trailer hitch caps, roof racks, power antennas, insignias, non factory (whether dealer add-on or private) aftermarket accessories such as alarm systems (including lock out expenses caused by) alloy, chrome or mag wheels, bug shields, sun visors, magnetic signage, running boards, hood ornaments, headlights, rear lamps, or reflector or for any damage caused as a result of customer’s request for engine detailing services including water interfering with engine function, or for damage caused by a request for any service requiring a wet sanding process. We assume no liability for fire, theft, or damage in any case except through our own negligence. We reserve the right to choose company used should any repairs be required due to our negligence. Our limit of liability in all cases is limited to the value of service provided or for cost of repairs should any repairs be necessary due to a collision that took place while the vehicle has been in our possession. Members will at no time leave a negative review. A negative review can either be a less than perfect “Star” or “Number” rating, or by using language that is considered less than desirable by the Unlimited Auto Wash Clubs. If this review is not removed within a 3 day period from the time it was written then the member may have his/her membership revoked without refund. Member should always attempt to have his/her complaint handled through the WashMe2@UnlimitedAutoWashClub.com email address or in writing to 9031 N Military Tr, Palm Beach Gardens, FL 33410. By using our services you agree to these Terms and Conditions. No employee can make changes to this contract. All services are provided on a best efforts basis. 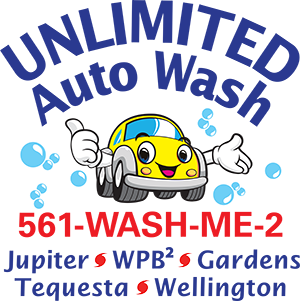 As such we are not responsible or liable in the event that we are unable to remove stains, clean, or fully restore any area of your vehicle. We are not responsible for; valuables left in vehicle, damage or injury due to faulty mechanical operation of vehicle, or vehicles that are not in factory original condition or any incidental damage that may occur while your vehicle is in our possession, including but not limited to any damage related to pre-existing conditions (tears, scratches, dents, stains, odors, etc.) damage to automated windshield wiper systems, loose trim or moldings, mirrors, power and mechanical seats and windows, vents, buttons and control knobs, door handles, roof racks, power antennas, insignias, plastic or vinyl windows, non factory aftermarket accessories such as alarm systems (including lock out issues) alloy, chrome or mag wheels, convertible tops, bug shields, visors, magnetic signage, running boards, hood ornaments, headlights, rear lamps, or reflector or for any damage caused from requested engine detailing services including water interfering with engine function, or for damage caused by a request for any service requiring a wet sanding process. We assume no liability for fire, theft, or damage in any case except through our own negligence. We reserve the right to choose company used should any repairs be required due to our negligence. Our limit of liability in all cases is limited to the value of service provided or for cost of repairs should any repairs be necessary due to a collision that took place while the vehicle has been in our possession. You are acknowledging that you have read and agree to these Terms and Conditions. No employee can make changes to this contract. *Once vehicle has left the car wash property we are no longer responsible for any damage or missing items.